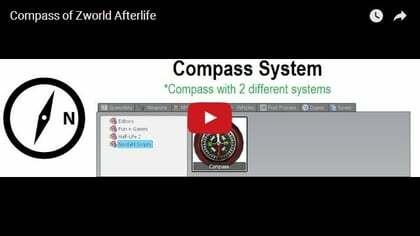 This is the Zworld-Afterlife compass. A game-mode that I am developing for 3 years. This version of this Compass is compatible with all the other addons. A compass showing the directions in a dynamic way. NordCOMPASS.PERMA_IN_HUD=0 --0= I need Compass In my inventory to see the compass(Realistic) 1=The compass is displayed in permanent to the HUD by default. No need the compass in the inventory. When you pick up the compass, she appears in your inventory. Select it like a weapon. When you selected it the display appears. You can also drop it by right-clicking when you have it equipped in your hand. The display disappears when you take another weapon in your hand. Since 28/november/2015 You can also spawn the compass in your inventory in gmod menu and weapons list.